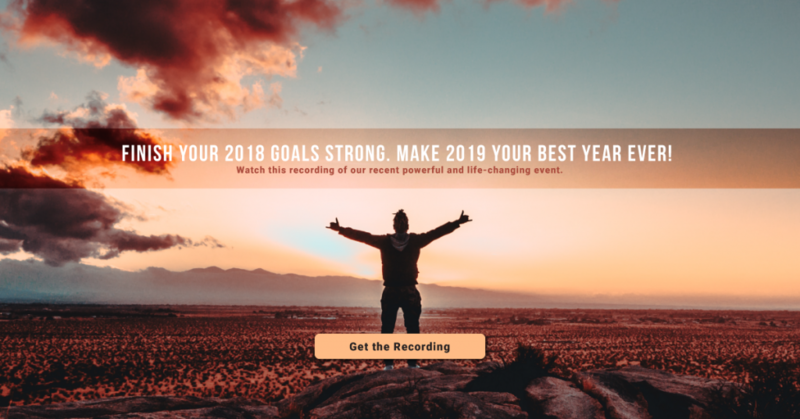 We recently hosted a on the topic “Finish 2018 Strong & Set the Stage for 2019 (Make It Your Best Year Ever)”. It was a great success and we’ve received some very positive feedback from attendees. If you missed out and you’d like to learn more about the power of positive thinking, you can watch the webinar, here. In this post, we’ll present a quick overview of some of the main points of discussion in the presentation. Important: This recorded link is only available for a limited time, so access it now before we remove it. In our webinar, we proved the power that negative emotion can have on your body by showcasing an exercise. The exercise involved thinking of a negative thought and experiencing the way your body feels. And then changing your thought to a more positive memory and noticing the difference this change can have on your entire body. It’s a great way to quickly demonstrate why negative thoughts can be so damaging. We know from the latest studies that pressure creates stress in your life and can inhibit your progress in reaching your goals. Make sure you choose tangible steps forward and be open to the process of change. Don’t pressure yourself to make immediate and lasting changes, as this can keep you in a cycle of negative thought. During the webinar, we learned more about the reticular activation system, and how it minimizes the information it sends that does not fit well with your way of thinking. When you’re unhappy, you see things that confirm your unhappiness. Getting out of this mode of thinking can help you gain control over the reticular activation system and use positive thinking to change your view of the world around you. It’s time to get ready for 2019 and move beyond the negative thought patterns of the past. To discover more about your personal path to improvement, please call our team today.